South Korean pool reporters, who were initially invited but excluded from the flight to the North from Beijing a day earlier, left for North Korea on a state-owned plane on Wednesday to witness the dismantling of the North’s Punggye-ri nuclear site. The plane carrying a total of eight reporters took off from Seongnam Airport at 12:30 p.m. The plane is expected to arrive in the North’s eastern city of Wonsan, where a press center is located, at around 2 p.m.
“As we are reporting on denuclearization of the Korean Peninsula, on behalf of South Korean media, we will be accurate and quick in covering the event,” said Yoo Choong-hwan, a reporter representing South Korean pool reporters at the airport. 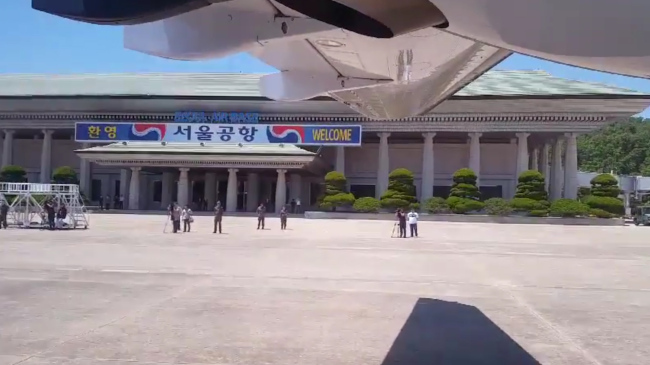 Meanwhile, foreign reporters arrived at Wonsan's Kalma Airport with an Air Koryo - North Korea's flag carrier - charter flight that had departed from Beijing. In addition to RT, the trip included media crews from RIA Novosti, AP, CBS, CCTV and CGTN, CNN, Sky, and Xinhua. North Korea has not disclosed further information on the exact time of the demolition of the Punggye-ri nuclear test site.